Cable Griffith, the Gallery Director at Cornish College of the Arts, paints peculiar worlds, full of familiar elements such as trees, lakes, hills, and skies stacked in odd, architectural structures that recall Pieter Bruegel the Elder’s Tower of Babel. 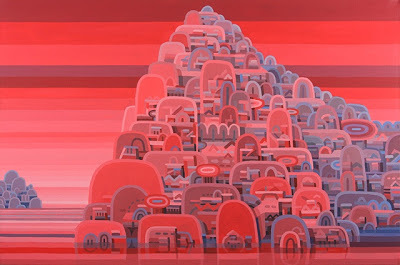 Rounded Guston-esque forms combined with hard-edge geometry, cryptographic linework, and precise color mixing create images of surreal landscape-like edifices, which, unlike Bruegel’s Tower, seem to exude a resolute cheerfulness…and yet, at the same time, reveal a slapstick version of apprehension and dread. 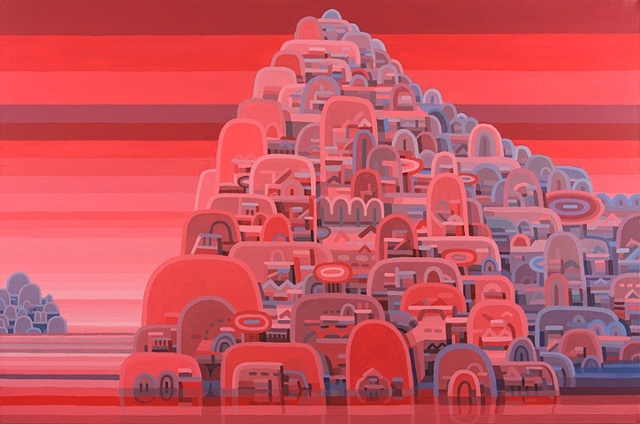 Aeaea, 2011, acrylic on canvas, 24 x 36 inches. 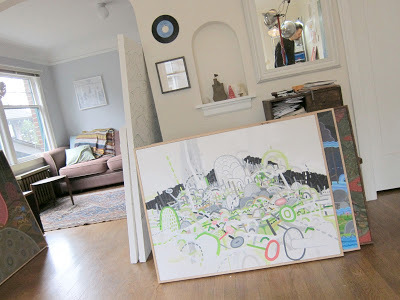 Griffith has converted his living room into a studio. 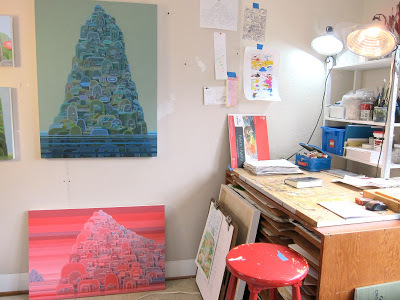 Here is his drawing desk and some recent acrylic paintings on canvas. Click to enlarge. 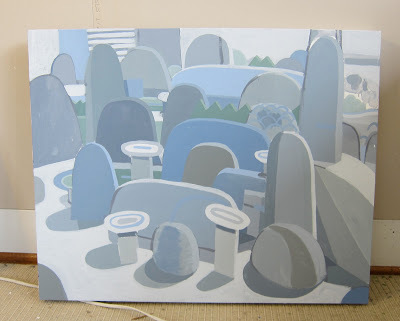 In earlier work, Griffith used the quirky geometric shapes he uses today, but he placed them in a more traditional, less tower-like, landscape space. Much of the canvas on this one is left unpainted. The forms in his paintings are based on perceptual study of these crudely made foamcore models. Griffith arranges them in groupings, then draws them, studying how the the light falls across the objects to determine shadow strength and placement. I like the way the color of this underpainting captures the bleakness of Seattle light. 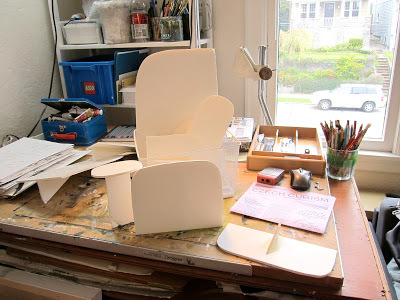 This is a straight still life from an arrangement of the foamcore models (pictured above) that includes the desktop space and a view from the window in the background. Sketch on canvas for a new painting. 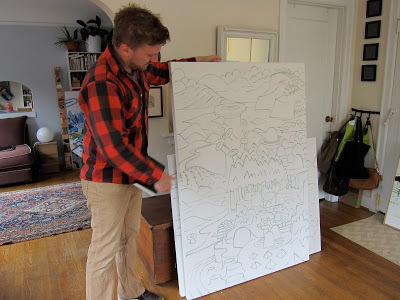 Griffith showed me one of the original ink sketches for a waterfall painting he was working on. The view from his studio features stacked retaining walls that hold lush green plantings on a steep hill. I forgot to ask if he chose the apartment because the view looked like his paintings, or if he started painting the stacked hills after he moved in. Beleaguered and dispirited, artists in Seattle, who have seen several gallery closings, diminished art sales, and fewer exhibition opportunities in recent years (on top of all that depressing rain), need some attention. 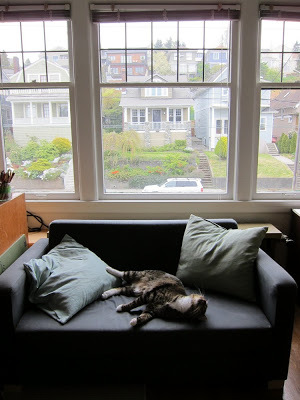 I have more Seattle studio visit posts underway. I really enjoyed seeing this work. 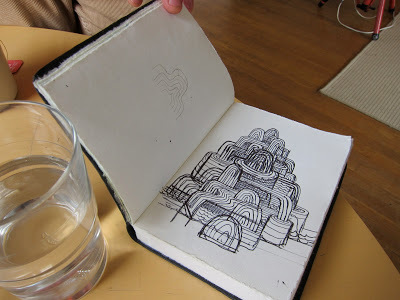 I always like seeing artist's sketchbooks (and the studio mascot) too. Thanks! I love the chalky look of the blue grey painting. really captures the light and space of the scene. beautiful! Love the space below the waterline, great paintings. The world up there, the world down there. Great paintings, I love the space below the waterline. The world up there, the world down there.